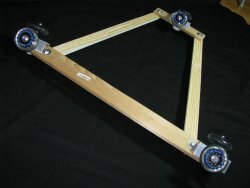 The good guys over at Age of Rockets are sharing their DIY design for a video dolly. Me likey. Unlike the iPhone Dolly or the PVC Skater Dolly which are for small cameras, this one allows you to mount a full fledged tripod on it. Probably a light camera only, but still better than a skateboard :). The dolly also comes with a set of cheap aluminum angle bars rails (~$10 for 96″ @ HomeDepot) for smooth motion. Basically it is nothing more than a few pieces of aluminum angle, some wood and bolts and 6 roller blade wheels. Did I say quick and dirty yet? This video shows the dolly in action. Loose instructions and more data (tipped by twitter) over at Age Of Rocket.